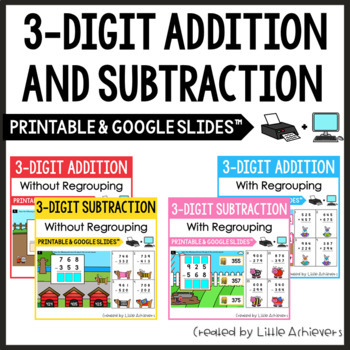 These pet-themed 3-digit addition and subtraction with and without regrouping packets would be fun and engaging for your math centers or small group activity. These packet are included in this >>>MONEY-SAVING ANIMAL THEMED MATH TASK CARDS BUNDLE. 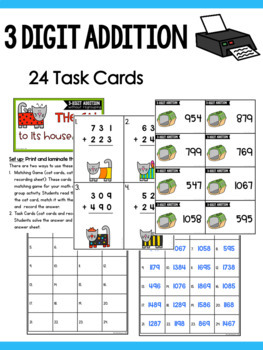 Each packet includes 24 task cards, recording sheet, and answer key. SAVE MONEY AND GRAB THE BUNDLE!! Set up: Print and laminate the cards. 1. Matching Game (animal cards, house cards and recording sheet): These cards can be used as matching game for your math center/small group activity. Students read the equation on an animal card, match it with the correct house, and write the answer. 2. Task Cards (animal cards and recording sheet): Students solve the answer and record it on their answer sheet. For more animal-themed task cards, please click here.